I’ve been blogging here at ednbrg since the dark, distant days of May 2008 and it’s proven to be my most successful attempt in nearly seven years of trying. There could be any number of reasons, but the two biggest ones are easily the support of the community of cocktail bloggers around the world and the fact that I’ve finally found a subject that I genuinely enjoy focusing on. With that in mind, I think it’s time to step things up. I’m going to keep posting recipes and reviews and anything vaguely mixological that catches my eye , but I’m moving the operation over to its own shiny new domain: Everything that was – and will remain – here is there. Please update your bookmarks and RSS feeds. Feedback is welcome via email and comments. Thanks for reading, see you at the new place! 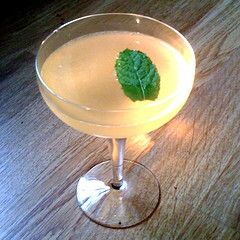 I’ve been thinking a bit about gin cocktails of late, which is useful given that all the recipes I’m currently owe various people and competitions are supposed to be rum based. I set myself to making a summery drink that wouldn’t be torture to make – essentially the polar opposite of A Walk In The Clouds. The recipe is inspired by the Victorian Mojito – basically a standard Mojito, but with gin and apple juice instead of rum and soda – but I wanted to get away from the shorthand of using crushed ice to signify summer drinks. From there, it seemed obvious to use elderflower to complement the gin and a touch of Angostura to bring everything together. It seems like just two weeks ago that Diageo’s Reserve Brands division named Aristotelis Papadopoulos as the World Class Bartender of 2009. But two weeks is a long time in the cut-throat world of cocktail competitions and the search for Aristotelis’ sucessor starts on Monday at a training day for Edinburgh’s bartenders on the Reserve Brands rum portfolio. It’s so unfair, having to go to a secluded bar and spend the afternoon tasting Pampero and Ron Zacapa. One last blast on the cachaca front – it turns out that I’ve only got two weeks to put together a recipe for the 2010 Cocktail World Cup, so the next batch of drinks are going to be more focused on a certain Antipodean vodka. 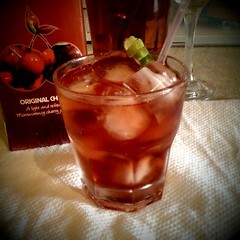 Anyhow, aged cachaca worked pretty well in a twist on the traditional Old-Fashioned. How does it fare in a modified Manhattan? Good, as it happens. 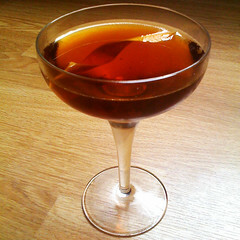 Abelha Gold is aged for three years but it won’t stand up to a particularly robust style of sweet vermouth, so it’s probably worth leaving the Punt E Mes and the Dubonnet in the fridge. …And now there’s one more: cachaca. There are aspects of the spirit that are still to be fully revealed to markets outside of Brazil and while some varieties are available in the UK, I suspect that aged cachacas are one of those categories. Abelha Gold is aged for three years in small barrels made from garapeira – a Brazilian hardwood – which gives the liquid a fantastic golden amber colour. The aroma is reminiscent of an anejo tequila – the vegetal notes are less pronounced, with hints of vanilla, cinnamon and caramel. It’s a proper grown-up spirit with a great range of flavour. Being honest, it’s the first aged cachaca I’ve spent much time with, but it’s made me eager to try more.